Having to move around to see your laptop screen is not only a pain, but you could also miss a cue point and disaster could strike! - Angled stand for better viewing with 1 cm rubber stoppers to keep laptop in place; we are so confident in the quality of stands that they are backed by a 2-year manufacturer warranty. dj deck stand with top shelf and fitting points for overhead. ( overhead not supplied ) Condition is Used. Collection in person only. 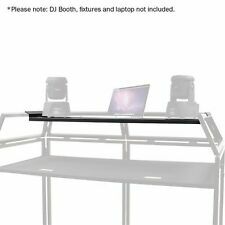 Equinox DJ Booth Laptop Shelf for Equinox DJ Booth System & Gorilla DBS DJ Booth. Aluminum corner shelf for Pro Event Table / Equinox Truss Booth. Corner shelf to be used with the Pro Event Table. 0.780 kg (single shelf). Corner Edge: 390 mm. Short Edge: 220 mm. Adjustable Mouse Shelf for Remotes, etc. Robust, yet Lightweight and Portable. Maximum Load (kg) : 15. Height Adjustable with Tilt Top for a Perfect Fit. Stand & Cases. Quick, Easy Assembly. Material : Steel. 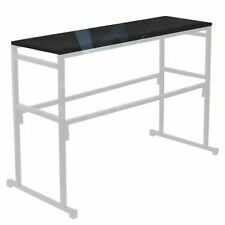 6ft EHKO Dj Stand With Shelves And Carry Bags. Sturdy stand shelves may need a clean steel frame Condition is Used. • Foldable and compact. Antoc Laptop Stand L1. Antoc’s new laptop stand L1 combines easy handling with sleek classical design. It can be easily assembled and disassembled without any effort and weighs only 1,5 kg. Ideally suited extra wooden plate with aluminum profile dedicated for DJ stands. Compatible with: DJ-4, DJ-4T, Dj-4 R-150. Supplied in two parts to cover top shelf. Hard Wood with Black Finish. Stand & Cases. Adjustable Mouse Shelf for Remotes, etc. Robust, yet Lightweight and Portable. Maximum Load (kg): 15. Height Adjustable with Tilt Top for a Perfect Fit. Quick, Easy Assembly. Material: Steel. Width (mm): 305. American DJ Pro Shelf (Pair) Aluminium Corner Shelves for ADJ Pro Event Table II. Gorilla stands quality. Heat Applied Carpet. Fold Under covering for best image. LIFETIME GORILLA STANDS WARRANTY INCLUDED! Rack Cases. Stand Accessories. Over folded edges for extra rigidity. Sturdy aluminium construction. DMX Lighting. Other Stands. Microphone Stands. Lighting Stands. 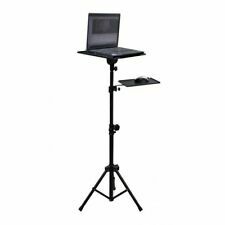 Folding DJ stand laptop shelf Mobile DJ equipment. Condition is Used. Collection only. i have shown a photo of the folding fascia that is on the front, this is fixed with double side Velcro. 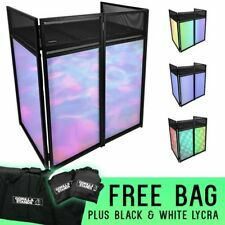 2 carpet covered shelves, designed for use with the Equinox DJ Booths (Order code: EQLED12 or EQLED12L for the lightweight version). Gravity Laptop Stand. Rapid set-up, with adjustable shelf and base angle. Why people choose Bop DJ. BOP DJ Showrooms. Folding laptop stands for all formats from 12" to 17". Compact transportation size. Height adjustable in 5 positions, 3cm (1.2") apart - Min height: 23cm (9.5"), Max height: 35cm (13.8") - Base coated with non-slip EVA foam. Add to Favourites. - EVA-coated, scratch safe no-slip support arms. Corner Shelf Kit for the Equinox Truss Booth System will also fit equinox / gorilla dj booths ( SEE PICTURES). 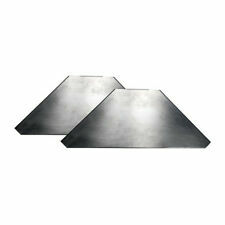 Truss Booth Shelf Kit (Pair). (BOOTH NOT INCLUDED). Includes: 1 x left shelf and 1 x right shelf. Mouse Shelf with Stand Clamp. Adjustable Mouse Shelf for Remotes, etc. Quick, Easy Assembly. Depth (mm): 204. MORE INFORMATION. Black Shelf for 4ft Deck Stand. Ideally suited extra wooden plate with aluminum profile for dedicated for DJ stands. Deck Stand is not included. Add to Favourites. 1305 x 300 x 635 mm.